This is classic Erik! 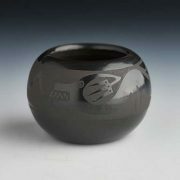 It is a traditionally coiled, painted and fired outside, black on black egg shaped jar. There is a band with one avanyu flowing around the entire top of the piece. Below that are clouds, and dragonflies and rain. The firing is fantastic! It has a gunmetal cast to it – a slate grey sheen. 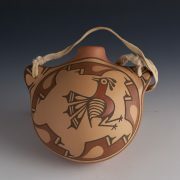 This is a classic example of a traditional San Ildefonso pot with both classic and contemporary designs. Born in 1970, Erik Fender is the son of Martha Appleleaf from San Ildefonso. 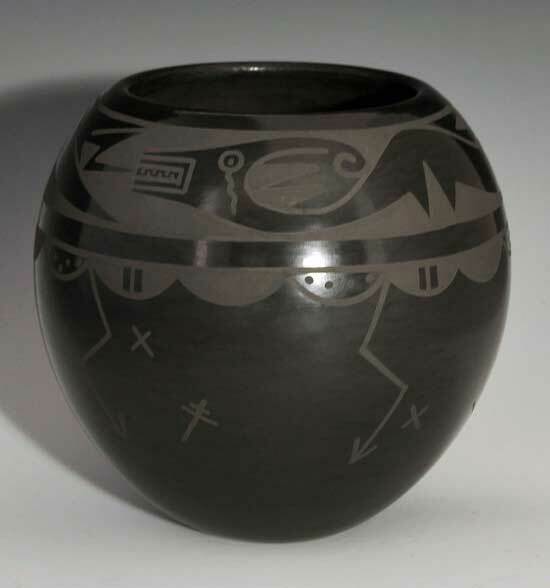 Both he and his mother are included in FOURTEEN FAMILIES IN PUEBLO POTTERY, and the new Greg Schaaf book on the Northern Pueblo families. Erik’s grandmother, Carmelita Dunlap (deceased) was a great influence on his work. Erik is a creative and talented potter. He uses all traditional techniques in his pottery making, but creates unique shapes and often uses interesting green slip in his work. 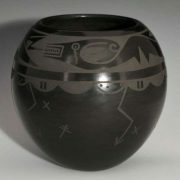 He combines traditional feather patterns with his own interpretations of petroglyphs and animal forms. 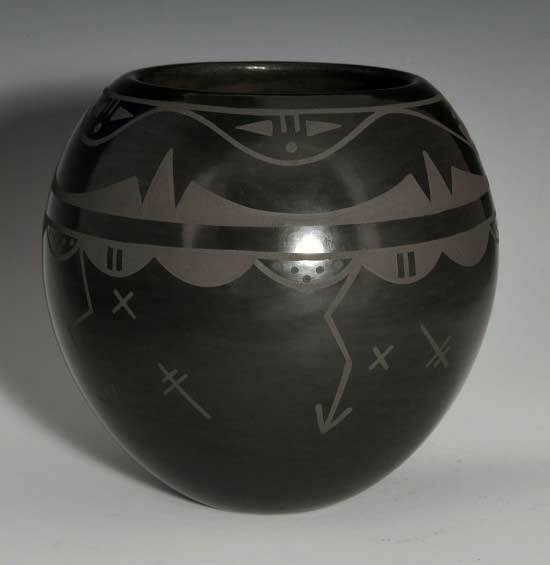 His pots are nicely shaped – and beautifully polished. We were so fortunate to have a one man exhibit for Erik. What a delightful guest!